Blondie and Brownie: Holiday Pop Pies and Baking off at Bon Appétit! 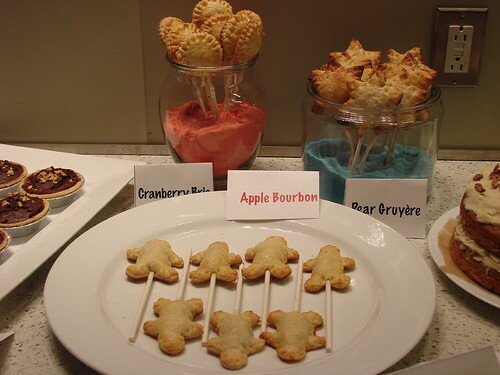 I love food and I love variety and the pie on a stick form really lends itself very well to making your holiday party fun and festive. First choose your favorite pie crust dough. I used two crusts for the Bon Appétit Blog Envy Bakeoff--more on that later, I promise. The first was my gruyère crust--tried, true and certifiably delicious. The second was an all butter crust recipe that I found on the New York Times site. After reading Melissa Clark's article, you may be very tempted to make a butter and lard crust. Hear me now. 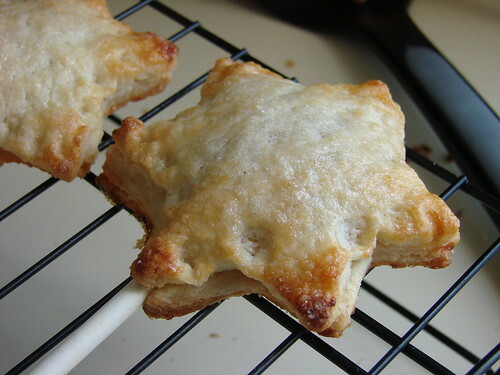 Lard crusts and sticks do not--I repeat, do NOT mix. 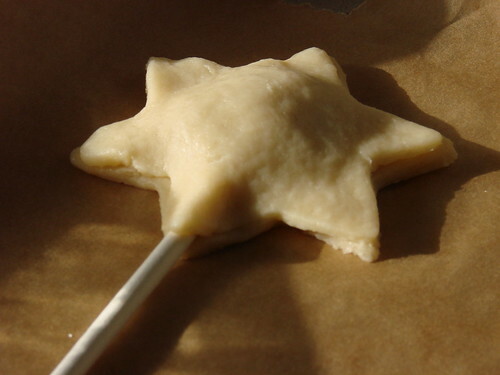 Admittedly, the leaf lard and butter variation in Ms. Clark's article makes for a lovely crust, but it is so tender and flaky it will not remain lovingly perched on a stick. Listen to the voice of reason (and experience). Add the flour, salt, sugar and grated gruyere into a a food processor. Pulse a couple times to mix. Add butter to the flour/cheese mixture and pulse in 1 second bursts until the largest butter chunks are the size of large peas (usually about 5 pulses). In 1 tablespoon increments sprinkle ice water over flour mixture pulsing once between additions to incorporate. Be careful not to add too much water. You can get an even water distribution by adding putting the water in one of those spritzer bottles. When dough begins to clump together as you stir, test the dough by squeezing it in your hands, if it forms in a lump then gather the rest of the dough together into two separate disks. Wrap the dough in plastic wrap and refrigerate for a couple of hours. Or if you are in a rush, toss the dough in the freezer for about an hour, when it's solid yet still gives slightly under your touch, it's ready to go. As your pie crust is chilling preheat your oven to 350 degrees and prepare your filling. For the Bon Appétit Bakeoff I wanted to showcase a variety of different fillings and crusts so I prepared three different pies, a spiced poached pear pie with the gruyere crust, an Apple Bourbon pie with the all butter crust, and a cranberry brie with an all butter crust for a slightly more savory dessert. The pop pie form is very versatile you just want to be sure that whatever you decide to fill your pies with isn't 1) too watery or "juicy" and 2) is mostly cooked. The pies only bake for about 15 minutes so you don't want to rely on that oven time to cook your filling for you. Add sugar, wine, water, vanilla, cinnamon stick, ginger, nutmeg and clove into a medium saucepan. Bring to a boil. Put an empty medium bowl into the freezer to chill. Peel and halve pears. Scoop the core and seeds out and then chop the pears into a small dice. Once liquid mixture has come to a boil add pears. Simmer for about 10 minutes or until the pears are tender. Using a strainer, separate the pears from the poaching liquid. Put the pears into the chilled bowl. Return the poaching liquid to a boil and reduce until you have about 3/4 of a cup of syrup. Add cornstarch to the syrup to thicken the syrup further. Pour the syrup into a measuring cup and chill. Once syrup has sufficiently cooled pour over pears and mix to incorporate. Once your crust is chilled and ready, roll it out as you would roll out a regular 9 inch pie. You want the crust to be nice and thin. 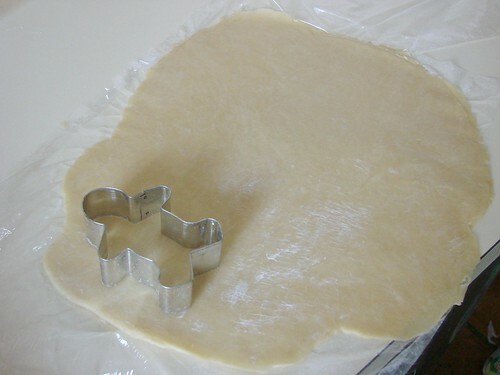 Then using a cookie cutter cut out shapes from the dough. 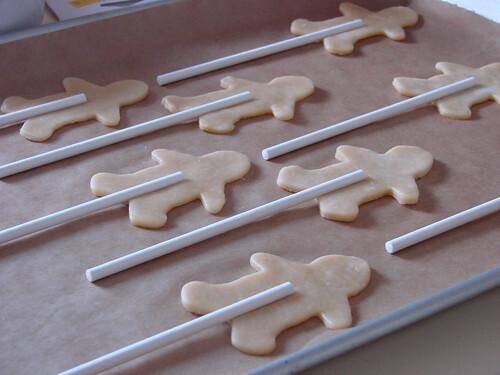 You'll find that you'll fare best when you choose a cookie cutter that has a fairly simple contour. I used a Star of David, a gingerbread man and the slightly scalloped side of a cookie/biscuit cutter. With the gingerbread men and the circular shapes I was able to fit 8 to a large baking sheet. With the Star of Davids I was only able to fit about 5. 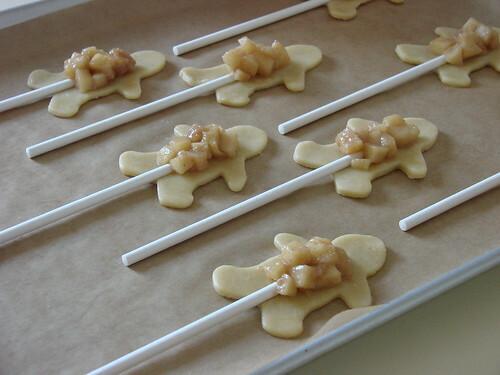 Once you've rolled your shapes lay them out like so on a baking sheet lined with parchment paper. Position the oven safe sticks so that the top edge of the stick is about halfway up the pie cutout and press down gently. Fill with about a teaspoon or a little more of filling. You want the pies to be as full as possible, but not so full that they burst while baking. Once you start layering the top crust you'll get a feel for how full is "too full." Next cut out more of your chosen shape for the top crust and gently lay it on top, taking care to match up top and bottom as best as you can. Gently press the top and bottom together along the edges sealing the seam. Using the edge of an unused oven safe stick crimp the edges together. You especially want to be sure to crimp the edges near where the stick protrudes. Next brush with egg whites and if you have a sweet filling sprinkle the tops with granulated white sugar. 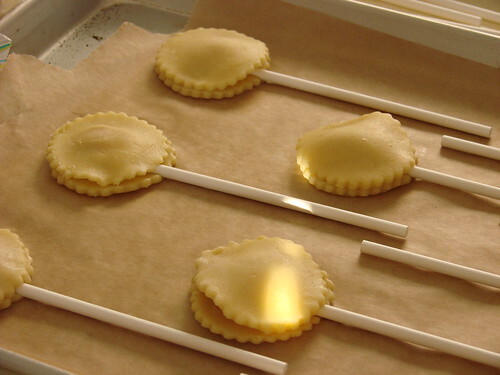 Bake for about 13-15 minutes until the edges are nicely browned. Remove from oven and cool on pan for 2-3 minutes. Carefully transfer pops from pan to wire rack. You don't want to move them too soon or they could break. Warning. 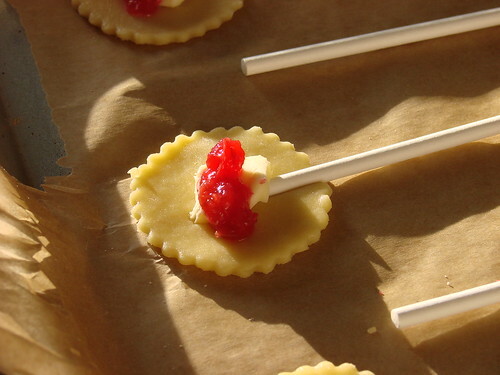 Not all of your pies will adhere properly to the stick. 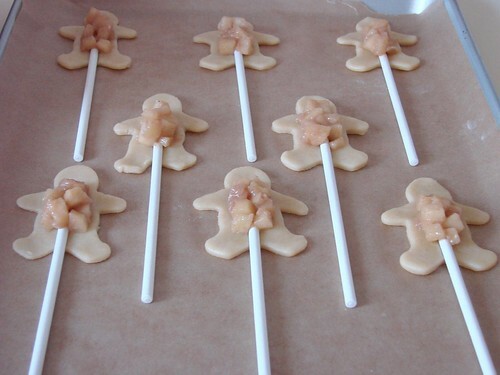 For the several dozen pops that I made, I had about 5 duds. The best bits of advice I can offer to avoid the duds is 1) make sure that your crust is thin, 2) make sure that your stick is centered, 3) make sure your crust pieces match up well, and 4) be careful to crimp those edges together nicely--especially those that are near corners or potential seam burst and the ones near where the stick protrudes. To serve I recommend filling a shallow and wide mouthed vase with festively colored granulated sugar. You can color white sugar by mixing white sugar in a gallon size ba with a few squirts of food coloring gel. Arrange pops like flowers in your sugar filled vase and you're ready to serve. What a great way to serve pie! Love, love, love these! So nice to meet you guys in NYC!